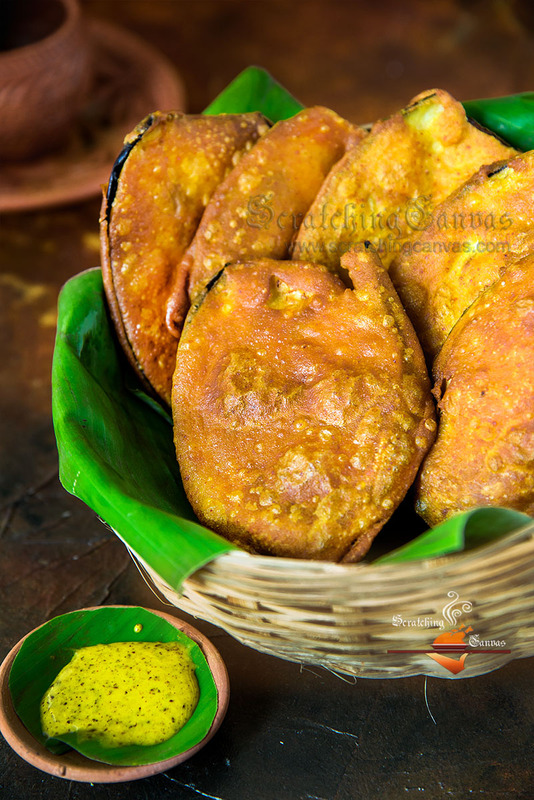 Beguni is one of the Hot favourite street foods of Bengali and it will quite appropriate if we call it ‘mother of Bengali telebhaja’. Beguni, the batter coated deep fried eggplant slices is extremely popular telebhaja (deep fried goodies) in united Bengal, West Bengal & Bangladesh. Every single bite into the thin slice of soft eggplant beneath the blanket of crispy coating explores richness of flavours. It is one of those versatile foods which can be enjoyed anytime of the day, from lunch to snack. Muri Beguni is the most popular way to enjoy this deep fried goodie. Drizzle little shorsher tel on muri (mustard oil smeared puffed rice) and bite into beguni-kancha lonka (eggplant fritter and green chilli) in between along with bikeler cha (evening tea). Another way to have beguni is with steamed rice and lentil on lunch. Often it is enjoyed with khichdi during monsoon. Making telebhaja at home is simple yet bit tricky; you need to keep few things in check. I’ve listed couple of key things to get perfectly crispy beguni over the period which I’m pointing below. The thickness of eggplant plays a vital role on how soft and juicy beguni will become. The ideal thickness should be in between 1 cm to 2 cm. neither less nor more than this. Eggplant pieces should be washed, cleaned yet dry. There shouldn’t be single drop of water in them. Drain and pat dry each piece as much possible. The batter has to be perfectly silky smooth and lump-free. I always maintain a ratio of maida, besan and rice flour as 2:1:1 and it works perfectly for me every single time. Pour 2 tbsp of hot oil in the batter to make any telebhaja crispiest. Season the batter generously, not the eggplant. Salt and other spices rub on eggplant makes it sloggy already which will never yield crispy beguni. Heat oil on medium flame. It may take time but result will be crispy and evenly cooked telebhaja. Watch my Fool-proof recipe of Beguni, Bengali Eggplant Fritter. Beguni is served with Kasundi and Muri (puffed rice) along with evening tea. Or with bhat r dal (rice & lentil) on lunch. Often it is enjoyed with khichuri during monsoon. Beguni should be served and consumed once freshly fried. It is not advisable for storage or later consumption. Discard the steam of a clean eggplant and cut it lengthwise with 1-2 cm width. See the video for reference. Wash and clean eggplant pieces and dry it with kitchen towel. There shouldn’t be any water on eggplant pieces. Heat oil in any deep bottomed pan which is suitable for deep frying. The depth of the pan should be more than 2”. Mix all the dry ingredients in a large bowl. Add water gradually little by little and keep whisking. Don’t add entire water together; this will make a large lump. Add little water, whisk to mix it thoroughly and then add again and so on. This will ensure lump free smooth matter. Now add 2 tbsp of hot oil into the batter and whisk quickly. This hot oil will make the batter silky and fries crispy. Now take an eggplant piece, deep in batter nicely to cover both sides with thick batter. shake off the excess batter and slide in eggplant in hot oil carefully. Don’t just drop the eggplant in hot oil, slowly slide it in. this way there will be no oil spluttering. Keep the flame on medium and cook beguni for 4 mins. Flip gently on other side and cook for another 3 mins on medium flame. If beguni is evenly browned and puffed up, your beguni is done. Remove from oil with slotted spoon and keep on kitchen towels to get rid of excess oil.